Submerging one’s self into another culture and providing medical and pharmacy care in an environment with few resources is a life changing opportunity for student learners, and the Southern Illinois University Edwardsville School of Pharmacy (SOP) is adding another such opportunity to its international learning experiences. The SOP has established a public health experiential rotation in Haiti that will begin Spring 2018. Kelly Gable, PharmD, associate professor in the Department of Pharmacy Practice and coordinator of global partnerships, and Misty Gonzalez, PharmD, clinical associate professor in the Department of Pharmacy Practice, traveled to Jacmel, Haiti March 6-13 to explore opportunities for future student learning. 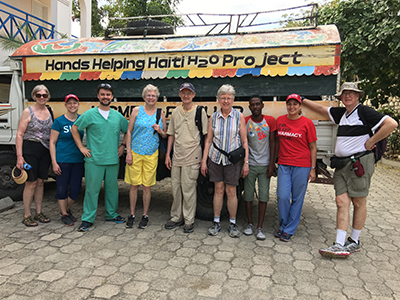 Part of a team of eight volunteer medical professionals, the two participated in a medical mission through Hands Helping Haiti. “The purpose of our trip was to explore pharmacy student learning opportunities while also providing medical care to an underserved patient population in Haiti,” said Gable. “The SOP aspires to create programs such as this, as we believe that hands-on, culturally submerging experiences promote both personal and professional student growth. According to Gable, through the new rotation, two fourth-year students will spend one week in Haiti, actively participating in the medical mission. They will then spend four weeks working on health education programming at two local shelters in St. Louis. The public health focus of the learning experience includes reduction in infectious disease transmission, substance use and harm reduction, and preventative primary healthcare. “These types of experiences are invaluable for the student learner,” added Gonzalez. “We are excited to add this international learning experience to the growing number of opportunities offered to SIUE pharmacy students in Guatemala, Jamaica, India and Costa Rica. While in Haiti, Gable, Gonzalez and team provided preventative and acute medical care to 301 children and adults through a pop-up pharmacy they set up in a local school. Common illnesses encountered and treated included scalp and skin fungus, ear infections, hypertension, diabetes, parasites and scabies. “Hands Helping Haiti travels to Jacmel twice a year, and sets up ambulatory care clinics and a pharmacy at The Modern School and Kindergarten of Savannette,” Gable explained. “This school is continually sponsored by the Hands Helping Haiti organization and provides education for pre-kindergarten through sixth grade students. When not providing direct patient care, the team had the opportunity to enhance their cultural awareness by visiting and learning more about the clean water project, trying authentic Haitian cuisine, and exploring the beautiful, growing art scene in Jacmel. Gonzalez documented the experience with the creation of this video. For more information, contact Gable at kgable@siue.edu, visit the SIUE SOP global education webpage, or follow the SOP Global Education Facebook page. 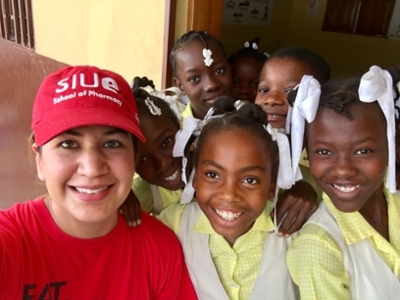 Photo: Misty Gonzalez, PharmD, clinical associate professor in the SIUE School of Pharmacy smiles with a group of girls from Haiti while participating in a medical mission trip. (L-R) Medical mission team members Charlotte Myers, of Byron, SIUE’s Kelly Gable, PharmD, Franklin Harry, DPM, of Next Step Podiatry Foot and Ankle Centers, Cheryl Bonte, RN and Steve Bonte, of Byron, Ruth Smith, nurse practitioner and co-founder of Hands Helping Haiti, local Haitian guide and driver Wilbert Aubert, SIUE’s Misty Gonzalez, PharmD, and Warren Smtih, RPh and co-founder of Hands Helping Haiti.